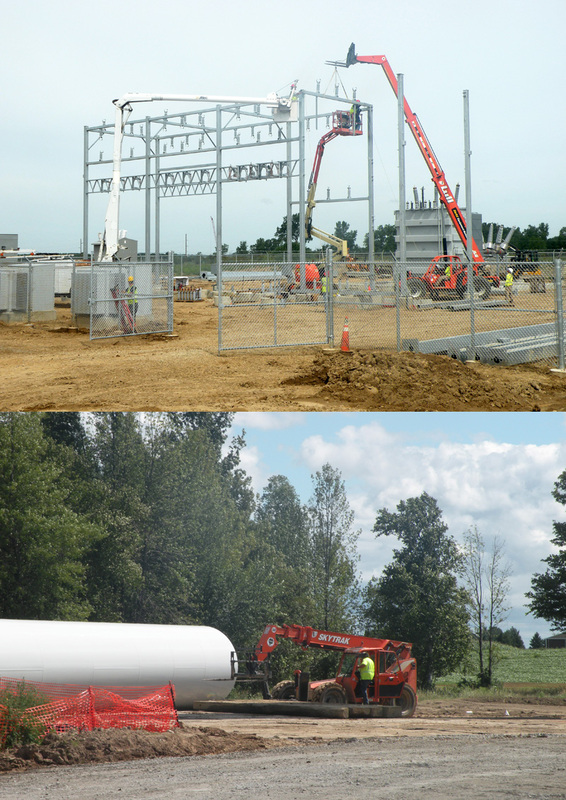 Exelon Wind's first development project, the Michigan Wind 2 farm, faced some high winds and rainy weather during construction, but contractors and workers were still able to complete the project by the end of 2011. In an ironic twist, developers of the 90 megawatt Michigan Wind 2 project in the thumb region of the Midwest state had to contend with too much wind during part of the project's construction. The challenge arose during the fall of 2011 when the project developer, Iowa-based Exelon Wind Corp., and its contractors were trying to erect 50 turbines near Minden City, Michigan. "We had some struggles with excess moisture, but the bigger effects were the wind days," said Doug Duimering, Exelon Wind regional manager of business development. "So we had a lot of days when we were sitting and waiting for lower wind days." Nevertheless, Exelon Wind and its contractors met their goal of having the wind farm completed and online by the end of 2011. It's that strong wind that attracted Exelon Wind and its predecessor company (John Deere Renewables) to the thumb region of Michigan in the first place. "There are some regions that stand out when you look at a wind resource map, and the thumb region stands out as an excellent wind zone," Duimering said. The Michigan Public Service Commission has designated the thumb region as "the area of this state likely to be most productive of wind energy." The region is also predominantly agricultural, and a transmission line runs through the thumb, all of which enhance its attractiveness for wind development, Duimering said. Michigan 2 is actually the second phase of the 69 MW Michigan Wind 1. When Exelon Wind purchased John Deere Renewables LLC in September 2010, it acquired both of the projects, as well as the 53 MW Harvest Wind I. At the time, Harvest Wind I was under construction, and Michigan Wind 2 was in the very early stages of development. The Michigan Wind 1 project consists of 46 turbines in Huron County, northwest of the Michigan Wind 2 project. "Since we purchased Michigan Wind 2, we significantly expanded the Michigan Wind 2 footprint and completed development work," Duimering said. "We had an interconnection agreement for 90 MW, but we needed to expand the footprint to support 90 MW." As part of that initial development work, Exelon conducted environmental studies on the impacts wind turbines would have on migratory bats and birds, Duimering said. They showed the project would not have a significant impact on the winged wildlife. The studies also concluded that the turbines would not pose a risk to populations of endangered species. In addition, noise studies showed the low-frequency sounds produced by the turbines were similar to those found in the area before wind farms were built, he said. The turbines also were situated in ways to minimize sounds that might be heard by nearby residents. As part of its initial site work, Exelon Wind conducted an investigation of the turbine options and determined that the V100-1.8 MW turbine from Danish manufacturer Vestas was the best fit, Duimering said. The contract included delivery and commissioning, along with a 10-year service agreement. "It has a relatively large rotor for its rated capacity," he said. "From a productivity point of view, it produces a lot of megawatt hours from this wind resource." When completed, each turbine stands 145 meters—476 feet—to the maximum tip height of the 100-meter blades. Some of the land around the site was in pasture, but most was in agricultural row crops. Other than building the construction and maintenance roads to the turbine site, there was very little additional site preparation, Duimering said. The roads were built without gravel so most could be reclaimed back to farmland after construction was complete. Access roads were built for construction and reduced to 15-foot roads at the end of the project, to provide future access for turbine maintenance. "Many of the farmers appreciate the site roads because it gives them more off-site access to their farms than they had before," Duimering said. The soil types in the area lend themselves to fairly standard turbine foundations. Using standard equipment, workers excavated eight to ten feet deep for the foundations. A cement foundation with a 65-foot diameter was then poured for each of the 50 turbines. Most of the turbine blades and parts, including the four-part towers, were shipped via rail from Vestas' Colorado manufacturing facility to a lay-yard near the center of the footprint. They were then offloaded onto trucks for final transport. "It had minimal impact on most of the regional transportation systems," Duimering says. "The main thing we trucked was the base of the tower. There are four turbine segments, and the base was too big to put on a rail car—not too heavy but too wide." To accommodate the trucks, some of the local road intersections had to be modified to allow the long trucks to navigate around the corners. Once all of the components are delivered, installation goes pretty quickly if the weather obliges, Duimering said. 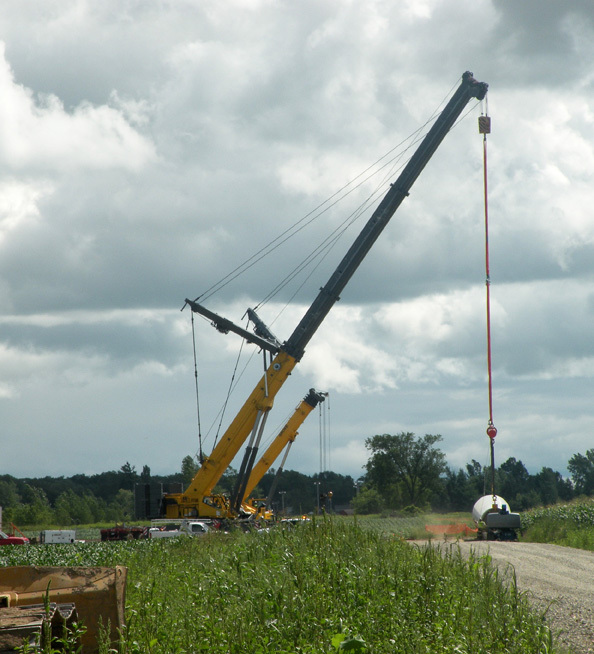 "The main thing is getting the crane to the turbine site," he said. 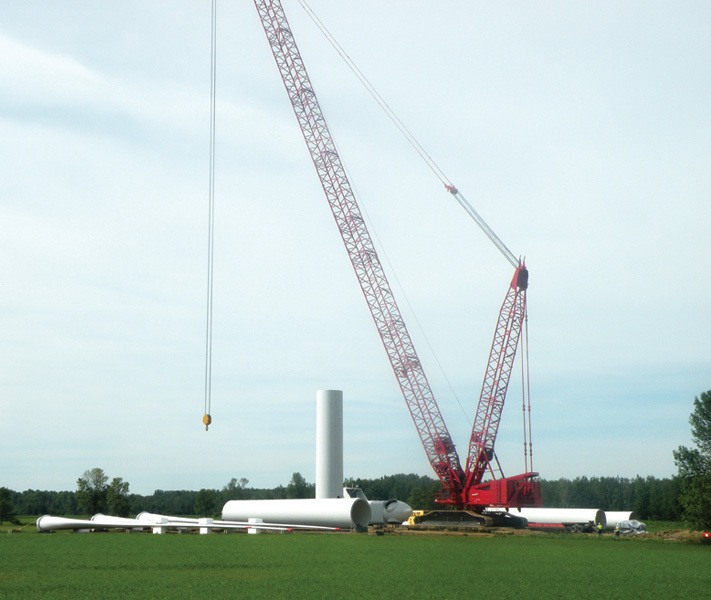 "Once the crane is set up and you have suitable weather, you can stack out the top segments of the tower and put on the blades and cell in one to two days." The Boldt Company of Appleton, Wisconsin, acted as the general contractor. Construction started in late summer, and an unusually rainy fall posed challenges to the installation. But it was the strong winds associated with the storms—the more than unusually heavy rain—that delayed installation at times. Nevertheless, the workers completed the wind farm by Exelon Wind's goal of December 31, 2011. Wind in the Michigan thumb region is somewhat seasonal, Duimering said. They can expect strong winds in the fall and winter, and therefore greater generation, and weaker winds in the spring and summer. S&C Electric Company of Chicago engineered, designed, and constructed the Michigan Wind 2 Project. S&C furnished and installed the 34.5-kV collector system for the turbines, including the switching equipment and junction boxes, along with 24 miles of cable. That aspect of the project was particularly challenging. Although Exelon Wind's construction practice is to install cable in the winter when it is less disruptive to farm production, most of the cable needed to be installed in the spring, requiring special negotiation with the farming community, said Dan Girard, S&C's director of renewable energy and energy storage business development. installed 12 miles of transmission line to tie the interconnection substation to the existing Michigan Wind 1 Project 120-kV transmission line. This too was tricky, Girard said.To minimize conflicts with the community, the line needed to be situated in hedge rows and in areas not already being farmed. Recognizing that the intermittent nature of the wind can create voltage stability problems on the transmission system to which a wind plant is connected, early in the project, S&C conducted a study to determine the need for VAR compensation at the Michigan Wind 2 Project. S&C manufactures a fast-compensating reactive power source called the PureWave DSTATCOM Distributed Static Compensator, which has been applied at wind plants around the world to reduce voltage variations and allow the plants to meet strict regulatory requirements. "The study showed that a PureWave DSTATCOM isn't required for the Michigan Wind 2 Project," Girard said. "The need for a compensation system depends on a number of factors, including the location at which the plant connects to the transmission system, and how it is connected." Although it turned out that a VAR compensation system was not needed for the Michigan Wind 2 Project, that isn't always the case, said Jim Sember, S&C's vice president of power quality products. "As wind farms are getting larger and there are more of them on the grid, we expect systems like ours will be increasingly needed," he said. "About 25 to 30 percent of wind farms don't require a VAR compensating system. Michigan Wind 2 is one such wind plan." Under a Power Purchase Agreement, Consumers Energy of Jackson, Michigan, has agreed to purchase the output from Michigan Wind 2 for 20 years. Exelon Wind is currently in the middle of constructing the Harvest Wind II project, the second phase of the Harvest Wind I project. The wind farm, consisting of 33 Vestas V-100 turbines near Pigeon, Michigan, is expected to be completed this fall, Duimering said. Exelon plans to expand its wind-generation portfolio through a combination of in-house development and acquisitions of projects developed by others that will be decided on a case-by-case basis, he said.